What is a Foundation in Construction? Foundation is the lowest part of the building or the civil structure that is in direct contact with the soil which transfers loads from the structure to the soil safely. Generally, the foundation can be classified into two, namely shallow foundation and deep foundation. A shallow foundation transfers the load to a stratum present in a shallow depth. The deep foundation transfers the load to a deeper depth below the ground surface. A tall building like a skyscraper or a building constructed on very weak soil requires deep foundation. If the constructed building has the plan to extend vertically in future, then a deep foundation must be suggested. To construct a foundation, trenches are dig deeper into the soil till a hard stratum is reached. To get stronger base foundation concrete is poured into this trench. These trenches are incorporated with reinforcement cage to increase the strength of the foundation. The projected steel rods that are projected outwards act as the bones and must be connected with the substructure above. Once the foundation has been packed correctly the construction of the building can be started. The construction of the foundation can be done with concrete, steel, stones, bricks etc. The material and the type of foundation selected for the desired structure depends on the design loads and the type of underlying soil. The design of the foundation must incorporate different effects of construction on the environment. For example, the digging and piling works done for deep foundation may result in adverse disturbance to the nearby soil and structural foundation. These can sometimes cause the settlement issues of the nearby structure. Such effects have to be studied and taken care before undergoing such operations. Disposal of the waste material from the operations must be disposed properly. The construction of foundation has to be done to resist the external attack of harmful substances. Allowable bearing pressure can be defined as the pressure the soil can withstand without failure. What is the Purpose of Foundation? Foundation are the main reason behind the stability of any structure. The stronger is the foundation, more stable is the structure. The proper design and construction of foundations provide a proper surface for the development of the substructure in a proper level and over a firm bed. 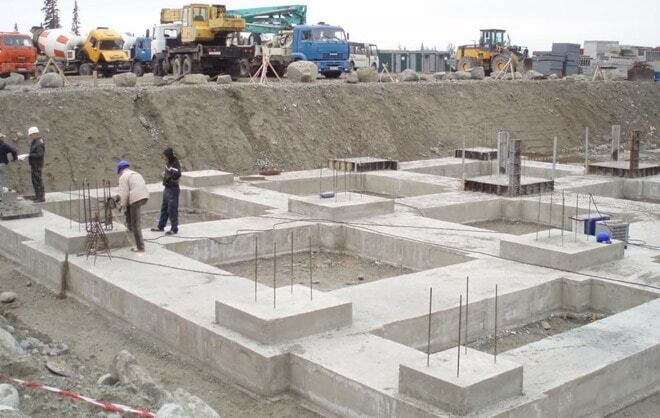 Specially designed foundation helps in avoiding the lateral movements of the supporting material. A proper foundation distributes load on to the surface of the bed uniformly. This uniform transfer helps in avoiding unequal settlement of the building. Differential settlement is an undesirable building effect. The foundation serves the purpose of completely distributing the load from the structure over a large base area and then to the soil underneath. This load transferred to the soil should be within the allowable bearing capacity of the soil. The design and the construction of the foundation is done such that it can sustain as well as transmit the dead and the imposed loads to the soil. This transfer has to be carried out without resulting in any form of settlement that can result in any form of stability issues for the structure. Differential settlements can be avoided by having a rigid base for the foundation. These issues are more pronounced in areas where the superimposed loads are not uniform in nature. Based on the soil and area it is recommended to have a deeper foundation so that it can guard any form of damage or distress. These are mainly caused due to the problem of shrinkage and swelling because of temperature changes. The location of the foundation chosen must be an area that is not affected or influenced by future works or factors.